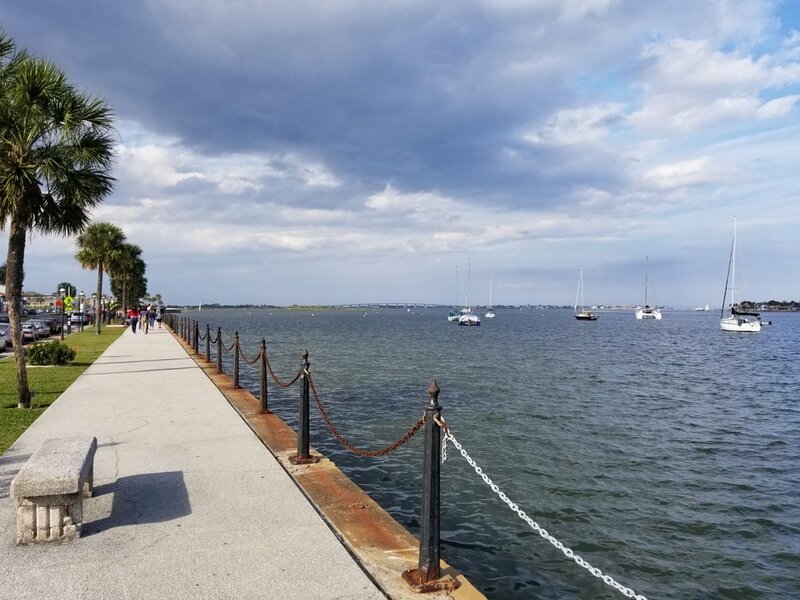 2/28 Thursday, 1162.9, 77/61, fog then sunny, calm - St. Augustine Municipal Marina, slip #18 - In order to be through Memorial Bridge before the closure slated for 7am, we were underway at 6am. Daytona has so much ambient light from development that navigation wasn’t much of a challenge. The bridge under construction looked like something from Gotham City, with un-connected raw steel sections looming in the glow. Three rowing sculls were out practicing. It took us a bit to figure out what they were, with their low-set navigation lights and length without superstructure. Some light fog hung over the waterway. We motored north in a gentle northeast wind, sipping coffee. I’m using the morning dew to wipe down the topsides. The sun came out, warming our bodies. The sky cleared to beautiful blue, dotted with soft white clouds. Motoring north on the Tomoka River. I navigated Grace past Matanzas Inlet without difficulty and also took us through the Crescent Beach drawbridge by myself, radio and all. It was a good day on the water. We pulled into St. Augustine at 2:30pm. The current was running to the south, so we had to dock bow-in. 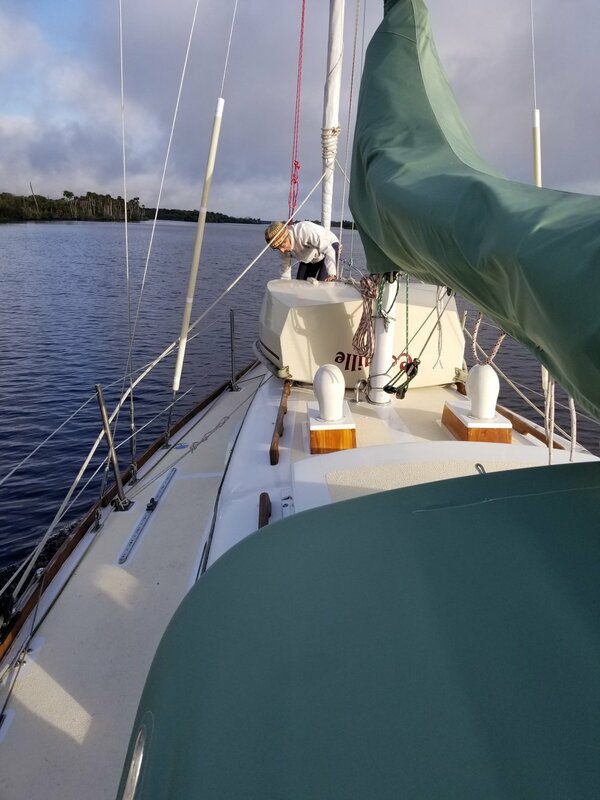 This means that, in order to make a successful exit in the morning, Grace will have to be hand-lined around about an hour before slack tide, to face bow-out. Conveniently, that was right after we arrived, even before we had the dock lines set. It’s pretty fun to do, shoving her out into the fairway and guiding her around with long lines - we get to admire our boat from all angles. Maneuver completed, next up was to top up diesel and ice. A bit after 3pm, we sat down to drinks and snack in the cockpit. Before dinner, we took Murphy for a long walk around town. He got petted a lot and scored some biscuits from a shopkeeper. We walked through a mob of kids on a school trip and they gathered around to pet his soft fur. I just can’t say enough about what a good dog he is, patiently letting them touch him, ears up and smiling, tail wagging. When we returned to Grace, Dobbs fed the pets and then we decided to take showers before dinner. We wanted to have a pint at Meehan’s later on. I made big salads topped with pan-roasted chicken breast. Then we walked over to Meehan’s. There was supposed to be a musician from 7-10pm, but something came up at the last minute, the bartender said. 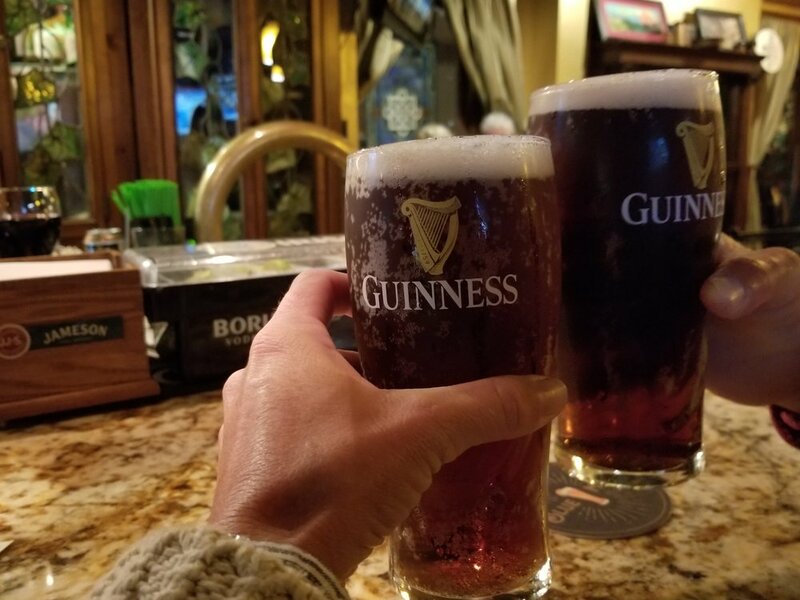 That’s okay - we enjoyed our Smithwick’s ales and the atmosphere of the pub. By 8:30pm, we were back aboard Grace and preparing for bed.